Jess's Many Mini Adventures in Food and Farming: Napoli, how I love thee. Napoli, how I love thee. Carrots, fresh from the ground, unearthed with a broad shoulder behind a broadfork, gently laid into a handcart for washing. Too-small carrots, overwintered under a blanket of hay, suspended until spring, when green shoots break and thick orange spears grow thicker and deeper into the ground. 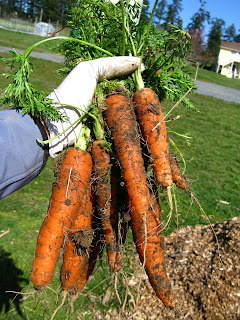 Extra early carrots, bred to grow faster and taste sweeter, grown from seeds with an organic seal, $25 for 10,000. Here on the farm, we grow Napoli carrots, a favorite of the veritable Eliot Coleman. It is one of the only crops we seed directly into the bed in rows 4'' apart, furrowed with the handle of a hoe. I sit on a planting board, making rows, placing each of 6,000+ seeds in the rows one-half inch apart, and covering the row back up with potting soil from my 5 gallon bucket. By the end, the bed is handsomely striped with the promise of carrots to come. The carrots can be planted in the late summer, where some will mature and be stored in the ground for use throughout the winter, and some might be struck by winter and wait in arrested development until spring when they revive themselves from wintery torpor and start growing again. They can also be planted in spring, to grow and mature in the early spring and late summer. 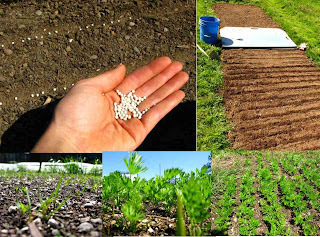 When the tiny greens mature into something carrot-like, we thin the rows and leave a carrot every 2'' to give them space to stretch out and grow straight. The tiny carrots are shorter than a pinky with the girth of a toothpick. According to John Jeavons, the king of the biointensive method, and one of our gurus here on the farm, carrots can produce 400 lbs per 100 sq ft. I don't know what our general record is, but I think we're a little below this target -- if you figure 1800 carrots per bed, each at 2.75 oz, that's around 310 lbs. When I first harvested carrots, the thing I noticed was the smell. Carrots smell intensely carroty and sweet straight from the ground. Even in the first thinning, when they are barely recognizeable... even this small, they smell like themselves. Some might be interested in "improving" food to suit a particular fancy, but it seems like there's something elemental and lovely about a carrot fully realized as itself. Funny thing about carrots. I never buy them. Every time and I mean every time I eat them I love them. Never buy them. Now you've got me craving carrots. I'm rattling off varieties and recipes like Forrest Gump's buddy, Bubba, did with shrimp. How long does it take these carrots to germinate? Right after I wanted my seeds in 2 large containers we got a lot of rain and I am afraid they got water logged. I did just plant some more in another large container and wanted to make sure of the germinating time. Thanks for your help.